ABCE: A mnemonic device used to help non-medical laypersons remember what to look for when checking out suspicious moles and skin growths. Biopsy: The excision of skin tissue that will be studied under a microscope by a pathologist, primarily to determine whether cancer is present within it. Chemotherapy: A powerful drug option that doctors may use as a cancer treatment. Dermatologist: A specialist doctor who focuses specifically on skin issues and diseases. Melanoma: Skin cancer’s worst form. If caught, diagnosed and treated early enough, its cure rate is nearly 100%. If allowed to spread beyond the skin and into the internal organs and lymph nodes, the odds can quickly drop until it becomes fatal. Metastasize: The spread of cancer cells from their point of origin to other areas of the body. Skin Self-examinations: Melanomas are caught first more often by a patient than by his or her doctor. 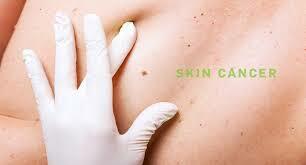 Skin self-exams are a thorough, periodic (usually monthly) checkup performed by ourselves, on ourselves. Using mirrors and/or assistance from a trusted friend, loved one or doctor, the entirety of the skin is looked over to see if any new suspicious skin growths or moles (or changes to pre-existing ones) have occurred. Melanomas can grow anywhere on the skin, which is why all areas must be checked. This includes such places as under the hair, (scalp) behind the ears, between fingers and toes, on the soles of feet and inside the mouth. Sunscreen: A vital, easily obtainable tool used to prevent harmful UV (ultraviolet) ray damage to skin that can lead to the development of potentially fatal Melanoma. It should be applied and continually re-applied whenever outdoors, regardless of weather or season. Tanning Beds: Indoor machines used to acquire tans. These beds should be completely avoided. Tans from them can be as bad, or even worse, than tans received naturally outdoors. Tanning beds can cause many varieties of skin damage, up to and including skin cancer and the potentially fatal Melanoma. Industry propaganda should be disregarded or ignored. The study cited HERE by SkinCancer.org reveals an extraordinary fact: tanning bed use causes a greater incidence of skin cancer cases, than those of lung cancer caused by smoking. UV (ultraviolet) Rays: Harmful rays that emanate from our sun. These rays are responsible for a significant amount of the skin damage that humans incur; from sunburns and wrinkles to skin cancer (the world’s most common cancer) and Melanoma. Regular practice of basic sun-safety techniques is extremely helpful in fending off the impact of these rays.